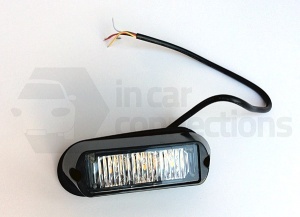 View our range of Interior LED Lighting including LED strip lights, work lamps and courtesy lights for use in vans, buses, taxis, 4x4, recovery vehicles, tractors and other commercial vehicles. This high quality LED work light with 10 bright LED's is designed to provide a brightly lit work area. The perfect low cost solution to providing an illuminated work area. This high quality recessed LED strip lamp with 18 super bright LED's is designed for the interior of commercial vehicles such as vans, buses, taxis etc. The perfect low cost solution to lighting the interior of your vehicle. This high quality recessed LED strip lamp with 10 super bright LED's is designed for the interior of commercial vehicles such as vans, buses, taxis etc. The perfect low cost solution to lighting the interior of your vehicle. 3 LED amber flash module for use on recovery trucks, lorries, vans etc. The amber flashing module has 17 flash patterns to choose from and we supply it with the mounting bracket and screws at no extra cost. 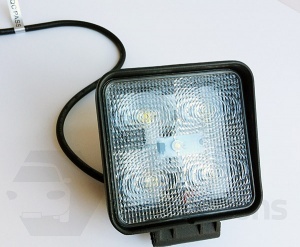 Universal LED flood light with 5 LED for recovery trucks, tractors, lorries, vans, 4x4 etc. High quality LED work lamp with 5 LEDs and heavy duty aluminium alloy housing plus a shockproof and waterproof design. Supplied with mounting bracket and screws at no extra cost. 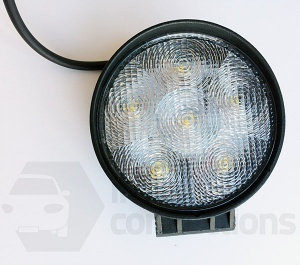 Universal LED flood light with 6 LED for recovery trucks, tractors, lorries, vans, 4x4 etc. High quality LED work lamp with 6 LEDs and heavy duty aluminium alloy housing plus a shockproof and waterproof design. Supplied with mounting bracket and screws at no extra cost.